A quick and easy, lightly sweet, drizzled, creamy, peanut buttery, healthy snack. 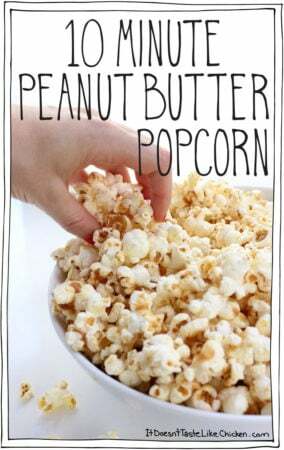 My new favourite nibble to quickly whip up for movie watching. Pop the popcorn in an air popper, or pop with whatever method you normally use (stove top or in the microwave works fine too). In the meantime, add the sugar, vegan butter, peanut butter, and vanilla extract to a small pot. Put over medium heat and stir together until the sugar is dissolved about 3 minutes. Remove from heat and drizzle across the popped popcorn while shaking the bowl. Stir to mix if needed. Let the popcorn cool for a few minutes before enjoying as it will be hot!